Mickey Mouse is one of the most recognizable animal cartoon characters, created by the Walt Disney Company. 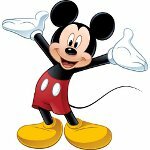 It's considered, that November 18 is Mickey Mouse's Birthday, and this unofficial holiday is celebrated by all Disney's cartoon lovers around the world. Mickey Mouse officially debuted in the short film Steamboat Willie on November 18, 1928. However, the audience could see the character even before. Its first appearance was a single test screening Plane Crazy. Walt Disney created Mickey Mouse to replace another character, Oswald the Lucky Rabbit. Disney asked Ub Iwerks to draw another animal character, various sketches or dogs, cats and even of a cow, a horse and a frog were rejected by Disney. Disney was inspired by a tame mouse at his desk and in 1925 the first sketches of Mickey Mouse were drawn. Disney fell in love with this character and provided its voice for 20 years. But due to coughing problems he had to pass this work on others. Today Mickey Mouse is a symbol of American pop culture. This character is loved in many countries and its birthday is celebrated throughout the whole world.